Today’s bento is not for me. Baby Girl has a party today and parents were given the option of bringing food for the kids. I decided to bring in onigiri or what people in Hawaii call musubi (moo-soo-bee). I got up at 4:30 am to do this because I’m such a die-hard crazy mom. Just kidding. I got woken up by a horrible stomach ache and by the time my ordeal was over, I decided to just stay awake already. I cooked two pots of rice to make pink rice and blue rice, adding two drops of red and blue food coloring to the water before I pressed the Cook button. I made two cups of rice each time and it turned out to be too much so I wrapped the extras in Glad wrap and froze them. FOR ONCE I did not waste rice! I am sadly a notorious rice waster when it comes to the rice pot. Before I highlighted my hair I had one white hair. After punching out 16 nori faces this morning I’m sure I must have at least 50. Getting a good sheet of nori that will punch right is SOOO rare. Punching these faces made me want to punch something else. 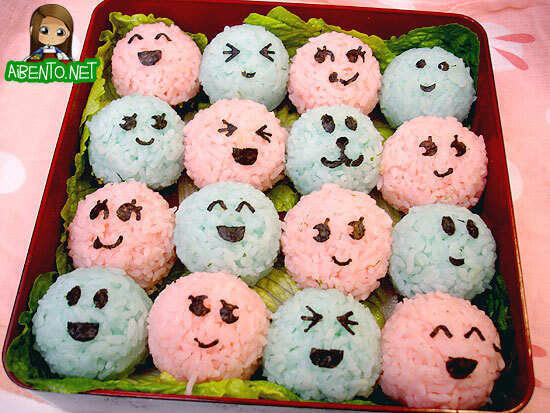 Like maybe me for deciding to put faces on these accursed riceballs. Hopefully the kids like them and eat them. Buddy liked looking at them, giving them a nice long “Whoaaaaa…” He’s such a great confidence booster for me! I won’t have a bento on Monday because we’re having our monthly work potluck. Have a great weekend all! !